Scientists and their work have an important place in every major aspect of American life. Many Americans hope that advances in science will improve people’s lives and enhance the economy. They are anxious to understand what innovations will disrupt existing daily activities and business routines. Policy arguments about science-related issues have held center stage in the Obama era, starting with protracted debates over medical care and health insurance and extending into concerns over energy and the environment, policies around food, challenges created by digital technology disruptions, and whether educators are preparing today’s K-12 students for a future with greater requirements for science and math literacy. 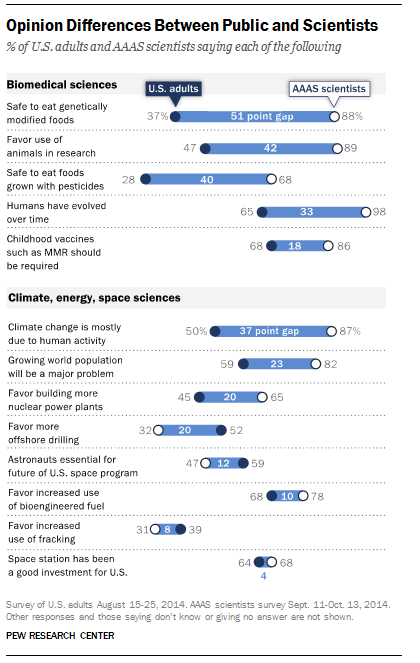 A report released Thursday by the Pew Research Center based on surveys of the general public and of U.S. scientists connected with the American Association for the Advancement of Science (AAAS) finds powerful crosscurrents of the views of the two groups. On the one hand, there is high regard and wide support for investments in scientific research: Fully 79% of adults say that science has made life easier for most people, and a majority is positive about science’s impact on the quality of health care, food and the environment. More than half of adults (54%) consider U.S. scientific achievements to be either the best in the world or above average compared with other industrial countries; 92% of AAAS scientists hold similarly praiseworthy views. On the other hand, there is clear evidence that the general public and scientists often see science-related issues through different lenses. For instance, there is a 51-percentage-point gap between scientists and the public about the safety of eating genetically modified foods – 88% of AAAS scientists think eating GM food is safe, while just 37% of the public believes that. In addition, there is a 37-percentage-point gap over whether climate change is mostly caused by human activity – 87% of scientists say it is, while 50% of the public does. The publication of this report begins a major new initiative for the Pew Research Center. We have explored science-related issues in the past. But today’s publication marks a more formal commitment to studying the intersection of science with all aspects of society – from public opinion, to politics and policymaking, to religious and ethical considerations, to education and the economy. There is considerable interest in the policy community, among scientists themselves, and among engaged citizens to understand how the fast-paced world of scientific inquiry and innovation is shaping America and the world. We hope to explore that and to understand more fully how news and information about scientific activities makes its way to citizens, how they understand it, and how, in some circumstances, they contribute to it. In the coming months, we will release more findings from our surveys of the public and scientists. A forthcoming report will provide a detailed analysis of the partisan and ideological differences that underlie some of the disputed policy areas. Another will pay particular attention to how people’s spiritual views and practices are tied to these issues. And yet another will look more directly at issues related to Americans’ general knowledge about science phenomena, updating previous research we have done about citizens’ science literacy. We will examine these and other issues related to a wide range of science topics and disciplines. In addition to gathering public opinion, we will survey and interview scientists for this work, and we hope to add research projects built around data that are not necessarily survey data – some might be “big data” and some might be small. We at Pew Research Center are excited to expand into these new areas and are especially looking forward to a deeper engagement with the scientific community and interested members of the public. Please feel free to share your thoughts in the comments section below or write to us here.